Mechanical—Minimum requirements are set on tensile and yield strength. Chemical—Chemical properties will be consistent with ASTM A1-92**. This data is published as a guideline only and does not replace the existing standard specification. *ASTM A499-15 Standard Specification, Steel Bars and Shapes, Carbon, Rolled from “T” Rails, Grade 50. Jersey Shore Steel Company rail steel angle dimensional specifications meet or exceed commercial standards*. **ASTM A1-92 Standard Specification for Carbon Steel “T” Rails. ***Results based on independent testing: yield and tensile averages based on 2300 test samples; chemical averages based on 355 samples of random-size rail. Complete copies of all specifications available upon request. Information subject to change without notice; revised March 2009. Shipments invoiced per cwt will be based on actual weights. A 1% variation between Jersey Shore Steel Company scales and consignee scales is considered permissible. 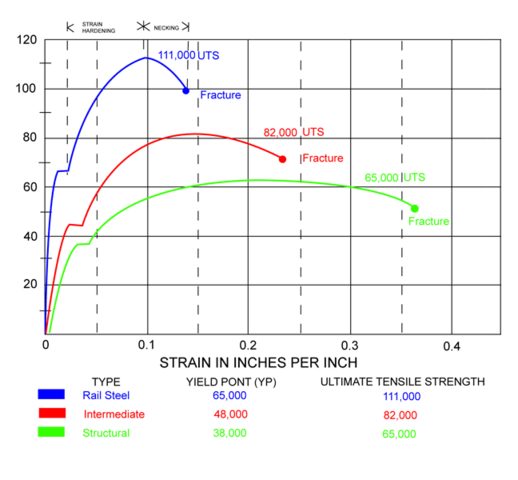 A variance of 10% is considered permissible on rail steel angle orders up to 10 tons. On quantities above 10 tons, a 5% variation is considered permissible.